● Visit the Blowouts page to view a selection of items discounted by up to 40%. ● The company has a 30-Day Return Policy. Replacement, refund or exchange will be observed depending on the product’s disposition. ● Free ground shipping is available on most orders totaling $49 or more. Qualifying products are identified with a “Free Ground Shipping” note. 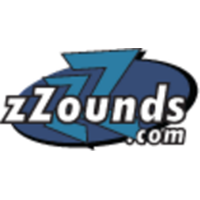 ZZounds is a music enthusiast clearinghouse of sorts, providing deep discounts on guitars, amps, keyboards, recording equipment, and live sound/PA solutions from some of the biggest brands in the business. Offering more than 3000 different products in their online product catalog (and adding more products on a daily basis), this company is home to brands like Gibson, Fender, QSC, and more. They also offer their own in-house financing solutions, a 12 month payment plan available to most anyone (interest-free), and a number of different shipping options that give customers all over the world the opportunity to take advantage of their discounted prices. For most up to date offers check out Zzounds on Facebook and Twitter or contact Zzounds Support for any questions.